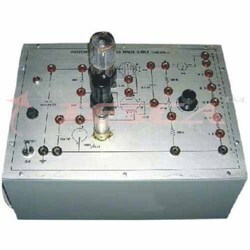 Pioneers in the industry, we offer r-c coupled transistor amplifier, diode characteristics trainer, transistor characteristics trainer, fet characteristics trainer, differentiating and clamping circuits and silicon controlled rectifier characteristics trainer from India. 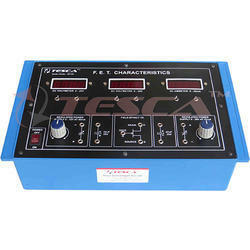 Experimental Training Board has been designed specifically for the study of Two Stage R-C Coupled Transistor Amplifier. Practical experience on these boards carries great educative value for Science and Engineering Students. Study of the overload characteristics of the amplifier. Study of the frequency response of the individual as well as the cascade amplifier. Calculate the output and input impedance of the individual stages as well as that of cascade amplifier. -12V D.C. IC regulated Power Supply internally connected. Experimental Training Board has been designed specifically for plotting the forward and reverse bias characteristics of a Germanium semiconductor Diode, and a Zener Diode. The board is absolutely self contained and requires no other apparatus. Experimental Training Board has been designed specifically to study the Transistor input and output Characteristics in different modes i.e. Common Base, Common Emitter and Common Collector. This Training Board is an improved version with Germanium NPN & PNP transistors in addition to Silicon NPN & PNP transistors and four meters. The board is absolutely self contained and requires no other apparatus. Two 0-10V DC at 50mA, continuously variable Power Supplies for Base Emitter & Collector Emitter junctions. Two Digital Voltmeter DC 31/2 Digit having Dual range of 2V / 20V. Two silicon (NPN & PNP) transistors and two Germanium (NPN & PNP) transistors. Experimental Training Board has been designed specifically to study the characteristics of a Field Effect Transistor. The board is absolutely self contained and requires no other apparatus. To study the characteristics of Field Effect Transistor. Show that FET work as VVR (voltage variable resistance). Calculate the FET parameters (drain dynamic resistance r , mutual conductance g , and amplification factor m) at a given operating point. Experimental Training Board has been designed specifically to study the Integrating, Differentiating and Clamping Circuits. Study of Integrating Circuit response at 1KHz and 10 KHz for different combinations of R and C.
Study of Differentiating Circuit response at 1 KHz and 10 KHz for different combinations of R and C.
Study of series and shunt Clamping Circuits. 0-10V D.C. at 20mA, continuously variable Power Supply. Square Wave Generator with switch selectable frequency ranges of 1KHz and 10KHz. Experimental Training Board has been designed specifically to study the Silicon Controlled Rectifier phase firing and D.C. control characteristics. 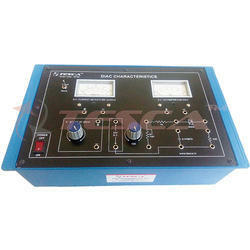 It is a training aid for advance studies in control circuits. To study the D.C. gate control characteristics (firing characteristics) of a SCR. 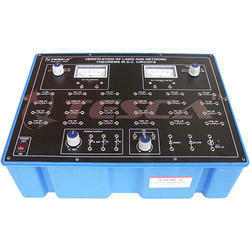 To study and plot the anode current characteristics of a SCR. To measure the holding current of a SCR. To study the plot the phase firing characteristics of a SCR. board is absolutely self contained and requires no other apparatus. e on this board carries great educative value for Science and Engineering Students. To verify Kirchoff's current law and voltage law. Verification of the series & parallel laws for resistances. To verify Thevenin's Theorem and to find equivalent voltage source circuit. To verify Norton's Theorem and to find equivalent current source circuit. To study the design of a multimeter. Experimental Training Board has been designed specifically to study the characteristics of TRIAC-a Bidirectional Triode Thyristor. Experimental Training Board has been designed specifically to study the characteristics and applications of a DIAC. DIAC is extensively used now a days in power control circuits. Experimental Training Board has been designed specifically to study De-Sauty Bridge and to compare the capacitance of two capacitors. 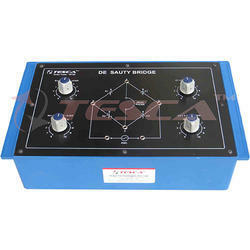 To study the working of a De-Sauty Bridge and to compare the capacitance of two capacitors. Two Decade Resistances, each with single dial in steps of 100W total 1kW, to from the two arms of the bridge. 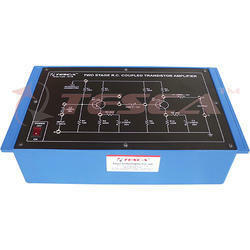 Experimental Training Board has been designed specifically for plotting Characteristics of Ge & Si Semiconductor Diodes. The board is absolutely self contained and requires no other apparatus. To Study and Plot the Forward and Reverse Bias characteristics of (Ge & Si) Semiconductor Diodes. To Determine the Static and Dynamic resistances of Forward Biased p-n junction of the given Diodes. Order Code - 36197 "OP-AMP DESIGNER" has been designed specifically for the study of OP-AMP IC and its applications. This training board covers nearly all possible applications of operational amplifiers IC and makes the student familiar with the fundamentals of OP-AMPS, their characteristics and applications in various fields.100 experiments can be performed by this OP-AMP designer. Experimental Training Board has been designed specifically to study over all characteristics of the Emitter Follower Amplifier. 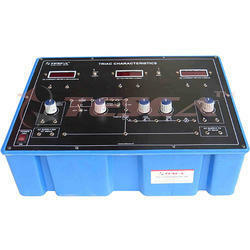 To study the over all characteristics of the Emitter Fol lower Amplifier and to find :01. Voltage Gain. IC regulated Power Supply internally connected. 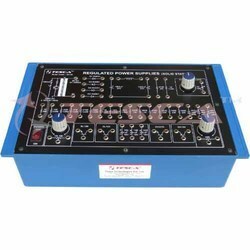 Experimental Training Board has been specifically designed for the study of Class B Transistor Push Pull Amplifier.Practical experience on these boards carries great educative value for Science and Engineering Students. -9V DC at 50mA, IC regulated Power Supply internally connected. 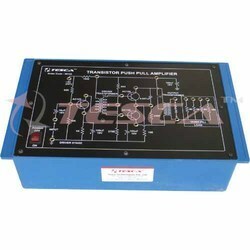 Driver Transformer and Output Transformer. Four different output loads selected by a band switch. Experimental Training Board has been designed specifically for the study of various techniques used for designing transistorised voltage. Regulated power supplies. A voltage regulated power supply forms an essential part of many electronic equipment. To study half wave rectification. To study full wave rectification. (a) Capacitor filter. (b) Inductor filter. (c) Choke input of L.C. filter. (d) CLC or p filter. 9V A.C. at 300mA, Power Supply. Three NPN and one PNP transistor including a power transistor. 4 diodes, 3 Zener diodes, 2 potentiometers, 1 inductor. Experimental Training Board has been designed specifically for the study of Electronically Regulated Power Supply. 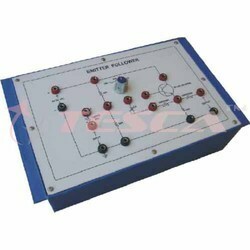 By this Training Board one can study the effect at output by variation of load and line voltage at input. 01. To see the functioning of a valve type voltage regulator. 02. To draw the load vs output voltage characteristics. 03. To see the effect of variation in line voltage on output voltage. 01. +300V D.C. at 60mA, unregulated Power Supply and 6.3V A.C. at 1Amp Power Supply. 02. Three valves fitted on base. 04. Mains ON/OFF switch, Fuse and Jewel light. 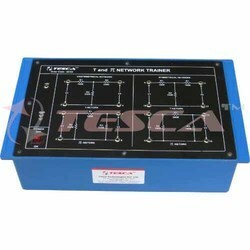 T and P Network Trainer has been exclusively and attractive designed to demonstrate the significance of image and characteristic impedance of T and p-network. 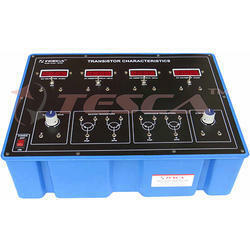 It can be used as a stand alone unit with inbuilt DC power supply. Various scope of learning makes the subject understanding complete. Experimental Training Board has been designed specifically for the study of Wien Bridge Audio Oscillator. 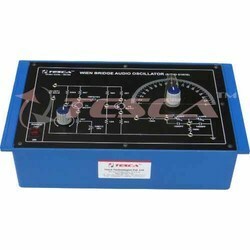 This Training Board helps to understand the utilization of Audio Oscillator and obtain oscillations at different frequencies. Practical experience on these boards carries great educative value for Science and Engineering Students. 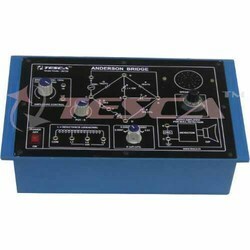 Experimental Training Board has been designed specifically for the study of Multivibrator circuits. Apart from basic circuits some special techniques have also been included. To study the waveforms of a free running multivibrator. To design and make a bistable multivibrator and to study its D.C. conditions. 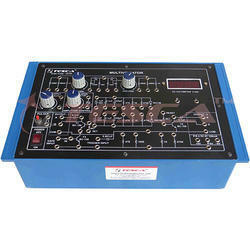 To design and make a monostable multivibrator and to adjust its delay time. To design and make schmitt-trigger and study its hysteresis. To control the frequency of a free running multivibrator with applied voltage. To design and make a gated free running multivibrator. To design and make an improved free running multivibrator. Experimental Training Board has been designed specifically for the measurement of inductance of a coil by Anderson Bridge. It includes audio amplifier with speaker for null detection (Instead of head phone) and one KHz sine wave oscillator instead of externally used decade audio frequency generator The board is absolutely self contained and requires no other apparatus. Anderson Bridge circuit with arms values. Potentiometer for varying one arm. Five capacitors selected by a band switch.